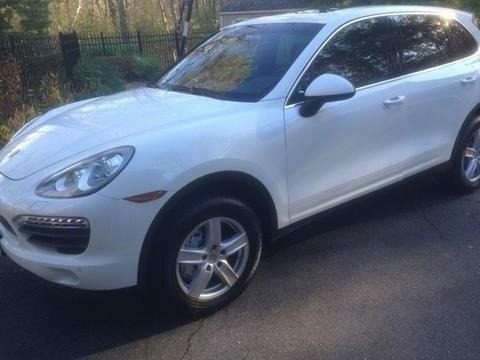 2014 Porsche Cayenne S For sale in Boxford, MA 01921 Embrace driving perfection behind the wheel of this 2014 Porsche Cayenne S presented in White. Under the hood is a 4.8 Liter V8 that unleashes a healthy 420hp while perfectly matched to an innovative 8 Speed automatic transmission. This team launches this Cayenne to 60mph in 5.6 seconds and serves up exceptional handling, precise steering and thrilling performance. You'll relish scoring near 23mpg on the open road while enjoying the sure-footed confidence of All Wheel Drive even when the roads are less than ideal. Our Cayenne S struts its stuff with an aggressive stance enhanced by 18 inch wheels, automatic headlights, foglights and a power liftgate. Slide into the well-appointed cabin and pamper yourself with dual-zone automatic climate control, supple leather seats with 8-way power adjustments, and the view from the sunroof. You'll stay focused on the road while using Bluetooth and a touchscreen interface with a 10-speaker sound system. Please call (402) 502-8385 for more information. ATTENTION BUYERS *Caveat Emptor* Please Remember to Inspect Vehicle Prior To Purchase!